Marking gauges come in several styles. I own two from Lee Valley and several from antique stores and other woodworking stores. I have altered the points on some by filing one side flat to make a knife edge, which improves their performance. None of them work as well, however, as the one Steve Latta taught me how to make in a class at Olde Mill Cabinet Shoppe. Steve's design works like other marking (and slicing) gauges, but with improvements. For instance, the knurled knob is on the bottom where it doesn't get in the way of your hand and it uses replaceable exacto blades, which are mortised into the wood behind the brass plate. The end of the blade is filed down a bit, so the tip doesn't break off in use. 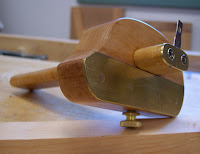 This gauge also excels at cutting thin strips of wood for inlay. Plus, it was fun (and easy) to make! So, I just returned from a trip to the Woodcraft Store to pick up supplies. As I was entering the store, an old dude said to me as he was leaving "Your husband said he'll take one of everything." Obviously, he thought I was there to pick up something for my hubby and never considered that I might be a woodworker. 1. I've been a woodworker for 15 years. 2. I have a workshop that makes grown men cry. 3. I teach classes at the Woodcraft Store. 4. I frequently give demos/presentations to the two woodworking clubs to which I belong. 5. I'm the president of our local woodworking club. Granted, I'm workin' the middle-aged soccer mom look pretty hard, but jeez! I get this sometimes from guys, not as much as when I was younger, and it forever catches me off-guard. I usually just smile in my befuddlement, but I'd love to have a funny comeback. Any suggestions?